Then it lists a whole lot of people from the Bible who no one would ever think could be used for the furtherance of God’s Kingdom. Rahab was a prostitute (who ended up in the generational line of Jesus). 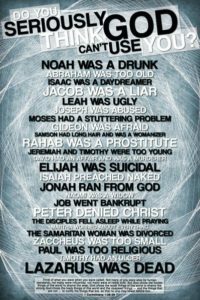 God also used a crazy man in the 16th century who was rude, crude and a Jew hater. He was also a worry wart, always thinking God was going to strike him dead for his sin. 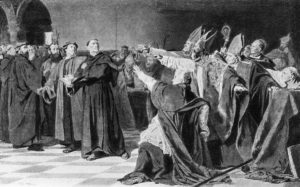 His name was Martin Luther and the reason you are a Baptist, Methodist, Episcopalian, Lutheran, Pentecostal or even a non-denominational believer is because of what he did on Oct. 31, 1517, commonly called the Protestant Reformation. It’s been 501 years since the day faith in God was RE-formed, and we celebrate our independence from hierarchical religion and cherish the truth that we can come to God on our own, by faith, through his Son Jesus Christ. Though this truth has always been with us, it was hidden for centuries. 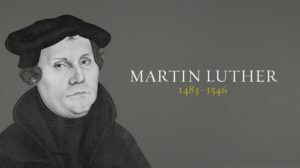 What Martin Luther did changed the direction of Christianity forever—all because God used this one man. 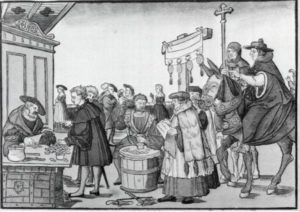 Every Christian should celebrate the third greatest Holy Day of the year after Christmas and Easter: Reformation Day, not that silly Halloween, the day that ghouls, ghosts and gross gaggles of the grave are happily acclaimed while death, murder and fiendish activity is lionized. 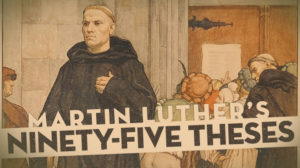 Professor Luther wanted to hold a debate with fellow faculty members on this subject. Any professor who wanted to hold one of these discussions would nail his questions and propositions, called theses, on the huge wooden door of Castle Church in Wittenberg, Germany. 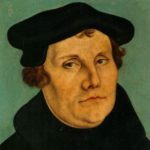 Luther nailed 95 of them to that door on October 31, 1517. He knew that the Bible taught that the only way to be forgiven of any sin was by repentance and trust in Jesus Christ. Through his own studies, he found that the Greek word for repentance meant a change of heart, not just doing good things to please God, as the theologians of his day taught. Here we stand, 501 years later, trusting that all who declare with their mouths that “Jesus is Lord,” and believe in their hearts that God raised him from the dead, are saved. For it is with our heart that we believe and are justified, and it is with our mouth that we profess our faith and are saved. ***Now, watch this great teaching by Dr. R.C. Sproul which shows how crazy Luther really was. Or was he?